Garden Angelica is native to the northern regions of Europe. For centuries the plant was used in European medicine to treat digestive disorders. The plant contains bitter compounds and essential oils making it an "aromatic bitter" that increase appetite, relieves cramping pain and fullness, and removes flatulence. Today it remains a common ingredient in “digestif” liquors like BÉnÉdictine, Vermouth & Chartreuse. 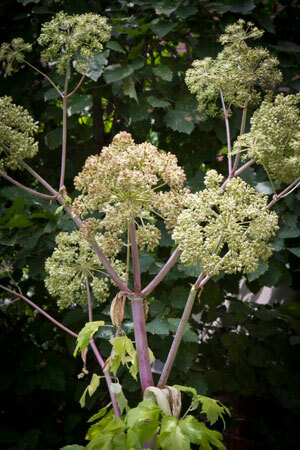 Before the advent of antibiotics, doctors used garden angelica to treat infections including the infamous plague. Herbalist still uses it for respiratory infections where its essential oils and other compounds both fight infections and help relax the smooth muscles of the respiratory tract to ease breathing. Furthermore, it may benefit cramping pains and urinary tract infections (UTI).